For my husband and me, Hico has become a hideaway destination when we seek rest and relaxation. Time was when our trips through Hico—frequently to view wildflowers in springtime—meant stopping only to devour a piece of legendary meringue pie at the Koffee Kup. Did Billy the Kid die in New Mexico or live out his days in Hico? We dig for answers. Upstairs Inn, Eis, and Pecan Street Drink Shoppe are at 202 N. Pecan St.
Koffee Kup Family Restaurant is at 300 W. Second St. Call 254/796-4839. The Billy the Kid Museum and Hico Visitor Center are at 114 N. Pecan St. Call 254/796-2523. Wiseman House Chocolates is at 406 Grubbs St. Call 866/460-3571. Sugar Moon Antiques is at 101 S. Pecan St. Call 254/796-4155. Hill Country Dwellings is at 118 N. Pecan St. Call 817/739-3614. Hico Popcorn Works is at 117 S. Pecan St. Call 254/796-4125. Back then, the old-fashioned, no-frills café was the primary reason anyone slowed down for long in this little burg. Today, however, our 80-mile jaunt southwest of Fort Worth focuses on enjoying restorative time at Hico’s Upstairs Inn. But as it’s situated in Hico’s teeny downtown, just a two-minute walk from the Koffee Kup, we initially thought of the inn as a posh place to sleep off a coconut pie hangover. No longer, however, do we regard Hico as merely a pie stop with a little Billy the Kid museum around the corner (some people believe the gun-slinging bad boy finished his life here in anonymity). These days, we appreciate the Upstairs Inn as a place to recharge our batteries while exploring all that Hico offers. In 2012, Upstairs Inn proprietor Jennifer Jones gave up her career as an accountant in Fort Worth to renovate the two-story limestone building at the corner of Pecan Street and Texas 6, discovering what she could about its past as the town’s telephone operations headquarters. Within a year, she and her boyfriend, Wes Lunsford, delivered three spacious guest rooms on the upper floor, each with a private bath, offering equal doses of luxury and yesteryear grace. Exposed rock walls date to the building’s beginnings in 1902, and gleaming wooden floors, antique furniture, and beds spread with fine linens make us wish our stay could last a week or so. The shared common area between the trio of guest rooms is a large parlor with high ceilings that opens onto a breakfast room and a kitchenette with a full-size vintage refrigerator. On one visit, a couple of women share one of the other rooms, and we politelyswap greetings over morning coffee. Another visit, we have the whole place to ourselves. Either way, my husband and I make good use of the fridge, stocking it with cheeses from nearby Veldhuizen and Eagle Mountain cheesemakers and Texas beers and wine that we purchase downstairs at Jennifer’s Pecan Street Drink Shoppe. When we return from sightseeing, we relax with nibbles and sips while reading and writing travel-journal updates. When browsing in the Drink Shoppe—pretty with its limestone walls and colorful posters by local artists—I’m always impressed with Jennifer’s knack for creating an interesting inventory. Not only will you find Texas wines from Becker Vineyards, Brennan Vineyards, Wedding Oak Winery, and Red Caboose Winery, but Jennifer stocks a fine selection of bottles from Europe and elsewhere in the United States, too. On Saturday afternoons, the Drink Shoppe offers tastings of wine and spirits from around Texas. But during lunchtime hours, we’re at Eis, the sandwich and sweets café Jennifer opened adjacent to the Drink Shoppe on the lower floor of the building. A particular recent lunch lingers in our memory, both for its deliciousness and its made-in-Texas pedigree: My choice, a combination of spicy pimento cheese and tomato jam from Weatherford’s Fire Oak Grill on toasted bread from Sulak’s Czech Bakery in Clifton, went well with a bowl of potato-green-chile soup; while Marshall’s Frito pie featured chili from the Texas Chili Company in Fort Worth and Eagle Mountain’s Granbury Gold cheddar cheese. These we washed down with La La’s Lemonade from Austin. For patrons who appreciate Texas products, Eis pampers the palate with its corral of Lone Star edibles. 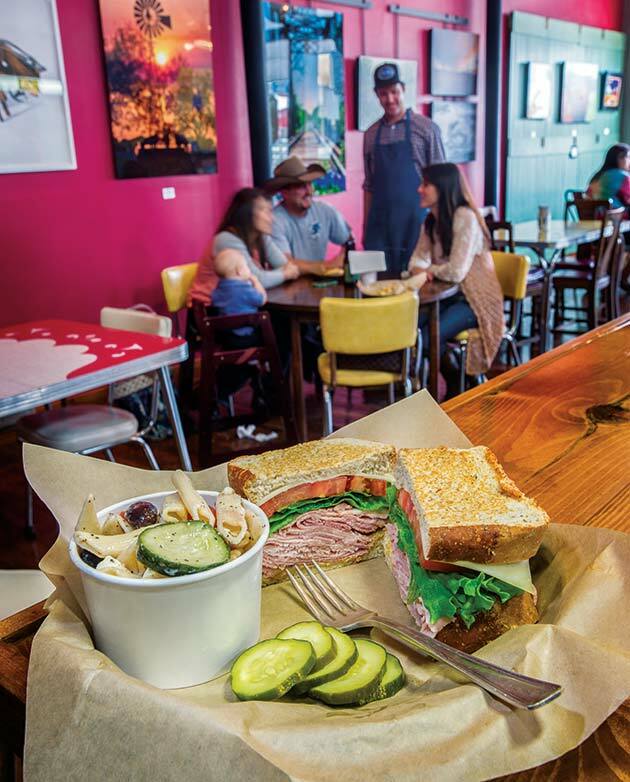 Sandwiches come laden with meats from the Hill Country and North Texas, and frozen treats come from Mom & Pops in Austin and Henry’s Homemade Ice Cream in Plano. Other desserts include gluten-free cookies and brownies from Sweet Texas in Liberty Hill (we love them not for virtuous reasons but because they’re irresistible) and Texas rum cake, frosted sugar cookies, and whoopie pies from Rollin the Dough, a small commercial kitchen in nearby Stephenville that also makes brownies and cheesecakes. Between Eis and the Drink Shoppe, we find an easy task of outfitting an impressive picnic basket and souvenir stash for friends at home. We’ll typically walk off some of our indulgences by strolling around historic downtown Hico. On the last visit, we fell in love with bottle and wine openers fashioned from horseshoes and heavy, handmade wooden tables at a shop called Hill Country Dwellings. Across the street, just past the 15-room historic Midland Hotel (currently in restoration), Sugar Moon Antiques won my interest with its stash of antique kitchen wares, including wooden spice boxes and pottery mixing bowls and pitchers. Sweets seem to find us in Hico. Hico Popcorn Works, a couple of doors down from Sugar Moon, lures us with its caramel popcorn aroma, warm and sweet in the air as we enter the shop. And Wiseman House Chocolates, found in a restored Victorian home just behind the Upstairs Inn, sells my favorite dark-chocolate toffee, as well as a varied collection of gifts and housewares. Wandering through the shop’s succession of rooms, I find a mountain of tea towels and pillows I’d love for my home. Back in our room, I’ll unwind over coffee and a chocolate truffle, curled up in the chaise longue in the corner with a good book, while Marshall naps on the sumptuous bed. Eventually, we’ll wander to the nearby towns of Walnut Springs or Glen Rose for supper, but we’ll be back Upstairs as soon as we can for a Texas wine nightcap. Inevitably, we dream about pie for breakfast at the Koffee Kup.